The heat of summer can have truly transformational effects. The literal likelihood of people wearing less clothing as a result of rising temperatures is one such effect, and the psychological lowering of inhibitions can follow thanks to a frustration with what seems to be an increasing and never-ending wave of warmth. Films like “Do the Right Thing” and director Liz W. Garcia’s previous film, “The Lifeguard,” have used summer as a driving force, and “One Percent More Humid,” which includes a weather forecast of sorts in its title, takes it one step further, spotlighting two characters struggling to make their way through a sweltering season. Iris (Juno Temple) and Catherine (Julia Garner) are good friends who have just been through a horrific accident that took the life of one of their friends, and they are decompressing during summer break in college. Time spent together out by the water pales in comparison to the illicit affairs that each of them pursues, Iris with her married college advisor Gerald (Alessandro Nivola) and Catherine with her late friend’s brother. Summer can’t last forever, and these two young women burrow deep into these fleeting relationships as they grow apart due to the secrets they’re keeping from each other. 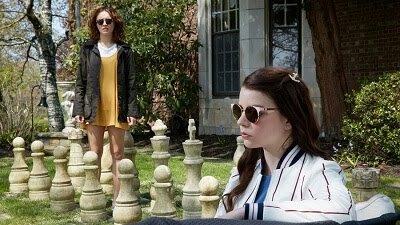 This is the kind of film that feels like it should be at a festival like Tribeca, honing in on two talented actresses to star in a coming-of-age story of sorts. Both Temple and Garner have already delivered breakthrough performances – I remember Temple most in “Dirty Girl” though she’s appeared in plenty else, and Garner played Lily Tomlin’s granddaughter in the underrated “Grandma.” Yet they’re both in their twenties and have bright careers ahead of them, which may take them to the kind of strong supporting roles in independent films played by actors like Nivola and Maggie Siff, who plays Gerald’s wife. Temple and Garner have different personalities, especially as portrayed here, making Iris the talkative, more outwardly flirtatious one, and Catherine the one able to blend into the background and often not noticed by those around her. They play off each other well, and Nivola and Siff offer dependable turns as full-grown adults who aren’t necessarily any more put-together than they are. This drama gets to know its characters well over the course of its runtime, making a definitive mark as an exploration of youth, passion, and the hand sometimes dealt to people by the universe.